This Slow-Roasted Lamb Shoulder and Root Vegetables is a classic Irish feast. The lamb shoulder is moist and tender after a long, slow roasting and the vegetables are perfectly cooked. Ireland is known as the Emerald Island as well as for the lamb that they raise in those beautiful green pastures. With Saint Patrick’s Day fast approaching we are excited to share this traditional Irish recipe with you. Our daughter-in-law, Gillian, was born and raised in Northern Ireland, specifically in Belfast and she has shared many Ireland memories with us. 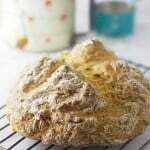 Gillian also has some impressive culinary skills, and she is my ‘go to’ resource for all foods Irish. 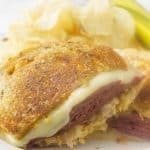 Consequently, from her I learned that the famous corned beef and cabbage dish is actually not a traditional Irish dish. Lamb, pork, fish, salmon, especially smoked salmon are very popular in Ireland. Beef…..not so much. Also, I hear tell that Ireland has some of the world’s best cheeses! 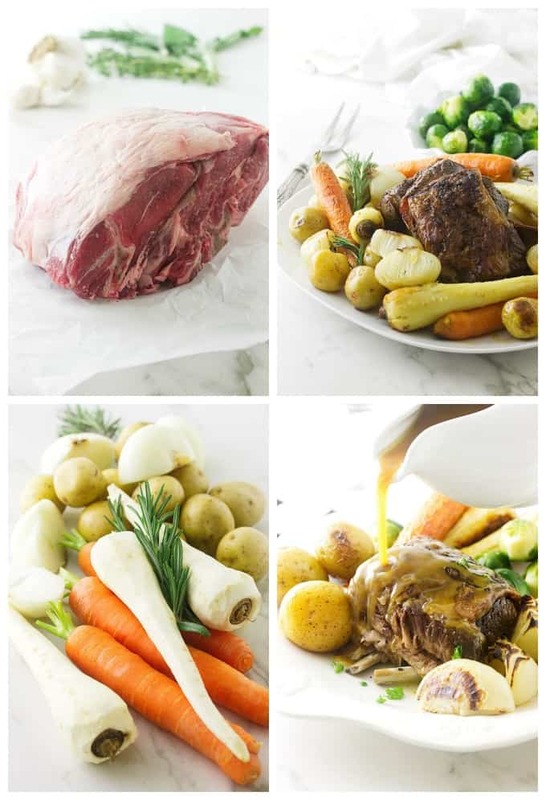 Lamb shoulder is an inexpensive cut, it is an excellent choice for slow roasting and will not disappoint you with its tenderness and incredible flavor. The butcher told me that the shoulder is the same cut as the chuck roast of beef so you can treat it the same. 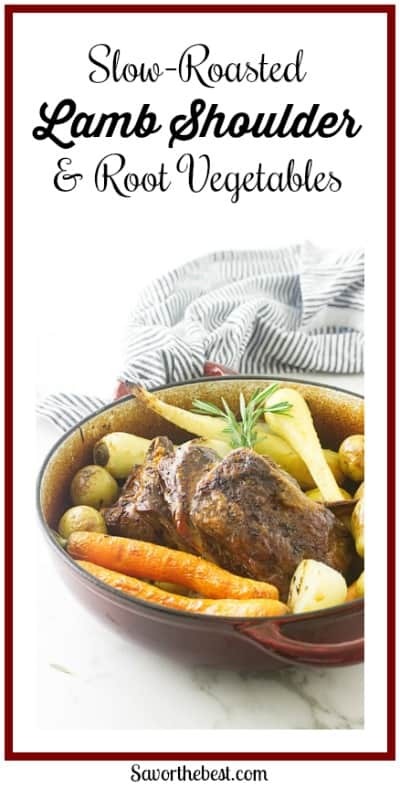 There is a lot of muscle working on the shoulder of the lamb as he romps and rolls over the hilly green pastures and it takes a long slow braise to tender up. Lamb shanks are another choice and easy on the budget. 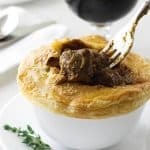 After a long, slow braise all those tough muscles loosen up into tender, succulent bites of deliciousness. The shank is one of our favorite cuts as you will see in our recipes for Braised Herb Lamb Shanks, Lamb Shank Osso-Buco Style or the delicious Lamb Shank Cassoulet. Lean Lamb Shoulder, Root Vegetables, brussels sprouts and smooth sauce. 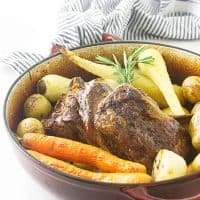 This slow-roasted lamb shoulder and root vegetables is a typical Irish meal for Saint Patrick’s Day. It is a simple one-pot meal. The lamb shoulder is braised for three-plus hours, in a low-temp oven with beef broth, garlic, and herbs. As a result of the long slow roast, the meat practically falls apart. Finally, the vegetables are added and by the time they are finished, the lamb is moist, tender and nearly falling off the bone. Of the lush leafy greens in Ireland, cabbage is a frequent visitor to the table, but we have paired this rustic Irish fare with small green brussels sprouts….. my family calls them ‘baby cabbages. 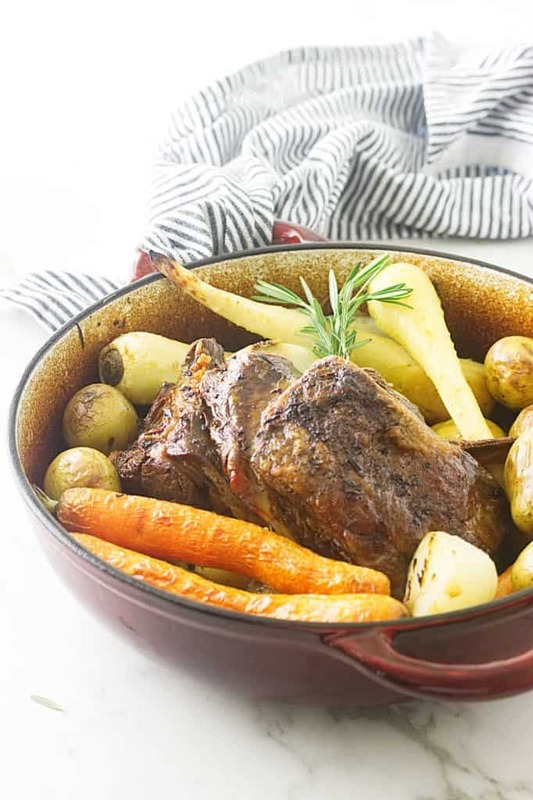 We hope you try this Irish style slow-roasted lamb shoulder and root vegetables for Saint Patrick’s Day. And don’t forget that pint of geniuses….it’s Ireland’s finest beer! Ireland began celebrating their patron saint as a religious celebration way back in the 10th century. St Patrick wasn’t actually Irish. He was born in Britain around 390 AD to an aristocratic Christian family, but he was not a Christian. At the age of 16, he was kidnapped by Irish pirates and taken to Ireland as a slave. After six years Patrick escaped and returned to Britain. He later had a vision of God that compelled him to return to Ireland as a missionary and preach Christianity to the Irish. Patrick was responsible for converting the Irish to Christianity and was named their patron saint. The shamrock is the unofficial national flower/symbol of Ireland, and it is said that Saint Patrick used the three leaves of the shamrock to explain the concept of the Holy Trinity—the Father, Son and Holy Spirit. Brush the surface of the lamb with olive oil then season well with salt and pepper. Set a Dutch oven over medium heat and when it is hot, place the lamb shoulder in a Dutch oven, fat side down, and sear to a golden brown. Remove from the heat, turn the shoulder over, bone side down and pour the beef broth around the sides. Add the sliced garlic, sage sprigs, thyme bundle and the bay leaves. Place the lid on the pot and transfer it to the oven. Roast for 20 minutes, then reduce the heat to 300°F and continue to roast for an additional 3 hours. Remove the pot from the oven and add the vegetables around the sides of the lamb shoulder, pour in the white wine or broth and replace the lid. Return the pot to the oven and continue to roast for an additional 30 minutes or until the vegetables are just tender but still slightly firm. Remove the pot from the oven, discard the bay leaves, sage and thyme bundle. Transfer the meat to a serving platter and arrange the vegetables around the lamb. Cover the platter with foil and keep warm while making the sauce. Spoon off as much of the accumulated fat as possible from the pan liquid, reserving 2-3 tablespoons for the sauce. Pour the remaining liquid from the pot through a mesh strainer set over a dish. There should be about 1 1/2 cups of liquid, if not add additional broth, water or wine. Add the reserved fat to a small saucepan set over medium heat, stir in the flour and cook for 1 minute. Stir in the pan liquid and bring to a boil, remove from the heat, whisking until smooth and slightly thickened. Transfer the sauce to a dish or pitcher and serve with the lamb and vegetables. Two or three large meaty lamb shanks totaling 3+ pounds can be substituted for the lamb shoulder. 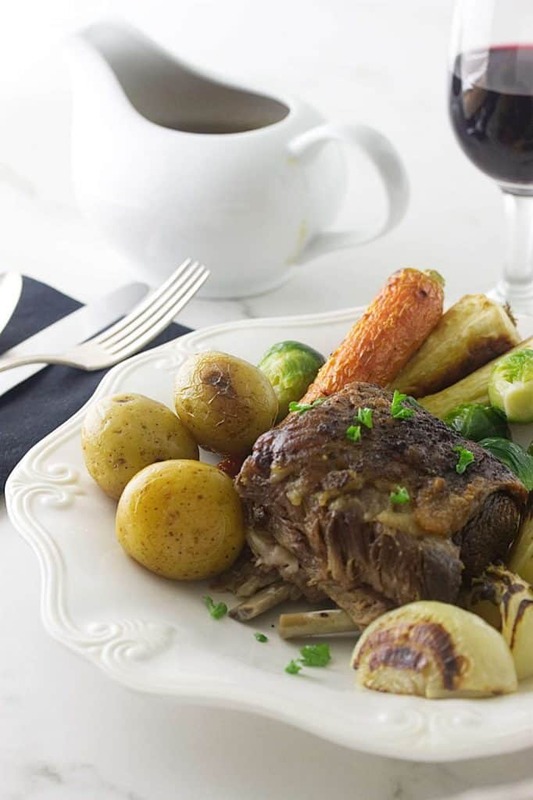 Have you made this dish of slow roasted lamb shoulder and root vegetables? We would love to see a picture. Tag us on Instagram. I’m a sucker for lamb. I’ve always used darker wines with lamb but I’ll have to experiment with the white. Thanks for posting this. Love lamb! And although I really like leg of lamb on the rare side, long-cooked lamb — braises and such — really have better flavor. Lamb shoulder is good stuff! Love it, and haven’t made one in AGES. Thanks for the inspiration!